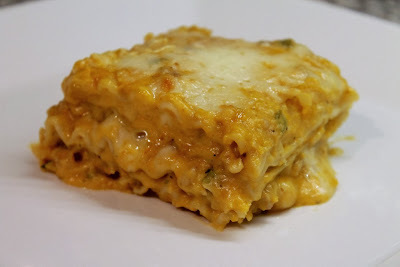 When I made bolognese lasagna in March, I mentioned that this fall version with butternut squash and goat cheese is one of my favorites. I liked the bolognese lasagna so much that I adapted some of the techniques from that dish into this one. For lasagna fans used to tomato-based sauces, butternut squash is a great alternative, especially during the fall and winter months. I didn't cook the sauce for such a long time; since the butternut squash is roasted separately, I didn't feel that was necessary. I did include béchamel sauce, rather than ricotta cheese, to give the sauce its richness. Marcella Hazan's instructions for making the sauce are the best I've seen. It comes out nice and thick. 1. Preheat oven to 400 F. Add butternut squash cubes to a large bowl and drizzle with 2 tbsp. olive oil. Sprinkle with salt and pepper and toss to coat. Transfer to a baking sheet and roast for 40 minutes. Set aside to cool a bit. 2. As the squash roasts, heat 1 tbsp. olive oil and 2 tbsp. butter in a Dutch oven or large sauté pan over medium heat. Add onion and sauté until softened, about 5 minutes. Add carrot and celery and sauté another 5 minutes. 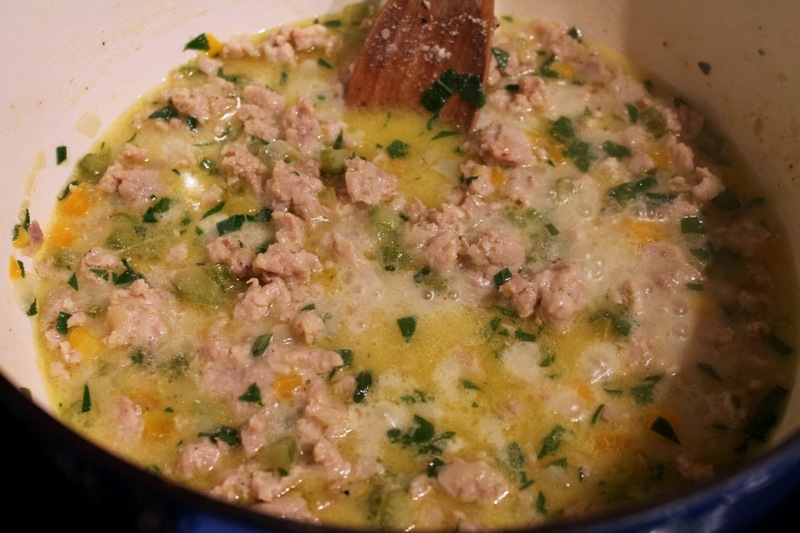 Add sausage, season with salt and pepper and cook, breaking up with a wooden spoon, until no longer pink. Add 1 cup of milk and cook, stirring occasionally, until the milk has mostly evaporated, about 15 minutes. Add wine and nutmeg and cook, stirring occasionally, until the wine has mostly evaporated, another 15 to 20 minutes. Add the chopped sage to the pot. Reduce heat to low and simmer until the squash is ready. 3. Transfer squash to a food processor. Heat the goat cheese in a microwave for 30 seconds and then add to the food processor. Process until smooth, scraping down the sides of the bowl as needed. Add to the pot with the sausage and vegetables and stir to combine. 4. Bring a large pot of salted water to boil. Add noodles and cook as directed for al dente. Drain and set aside. 5. 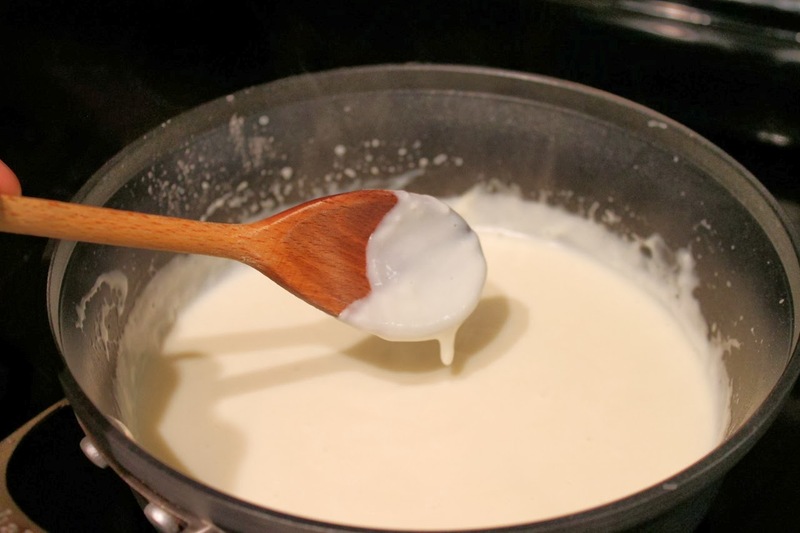 Make the bechamel sauce: Heat remaining 2 cups of milk in the microwave until warm (about 2 minutes). Heat 4 tbsp. butter in a heavy saucepan over medium heat. When melted, add flour, whisking constantly. Remove saucepan from heat. Add 2 tbsp. of the warm milk and whisk to combine. Continue adding milk in 2 tbsp. increments, whisking to combine, until half the milk is combined. Then add the remaining milk in two 1/2-cup increments, whisking to combine each time. Cook over low heat, whisking constantly, until thickened like sour cream. Set aside. 6. 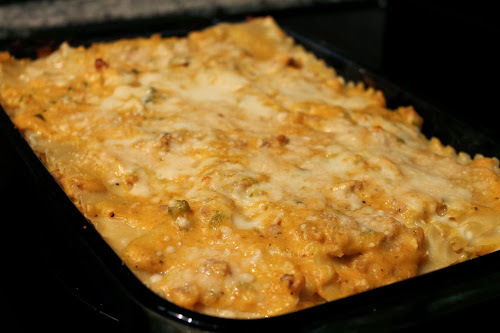 Assemble lasagna: Brush bottom of a 9 x 13 baking dish with 1 tbsp. of olive oil. Spread 1 tbsp. of bechamel evenly on the bottom of the dish. Lay down a layer of noodles (with standard lasagna noodles, 3 laid the long way should be enough for one layer, so with 18 noodles, plan to make 6 layers). Stir remaining bechamel into the sausage-butternut squash sauce. Spread a layer of sauce on the noodle layer (aim to use about 3/4 cup of sauce per layer). Spread about 1/2 cup shredded mozzarella on the sauce. Repeat layering (noodles, sauce, cheese), finishing with the grated parmesan on top. Bake until bubbly on the sides and golden on top, about 15 to 20 minutes. Allow to cool for about 10 minutes before serving. Was this ever delicious! The butternut squash was really good.